What an incredible change in the country from where we have been previously. We are now on the Atherton Tableland, surrounded by green hills, mountains in the distance and lush, dense rainforests. There are people everywhere and Malanda has quite a few shops. 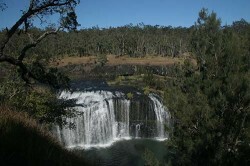 On the way to Malanda Falls, we called in to Millstream Waterfall and had a picnic lunch. Russ walked into the falls, which are the widest falls in Queensland. 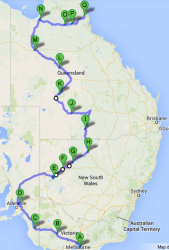 We are staying at the Malanda Falls Caravan Park and have booked in the a week. The park is located next to Malanda Falls Environment Park and has rain forest on two sides of the park. As you drive around the area there are signs to watch out for tree kangaroos, hopefully we may get to see one. Except that they are nocturnal, so the chances are dim. 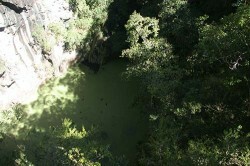 further 70 metres deep. They have built an extensive viewing platform now. In 1981, there was just a railing around it. On the way back Russ walked a second track to Dinner Falls, which are on the Barron River that reaches the sea near Cairns. 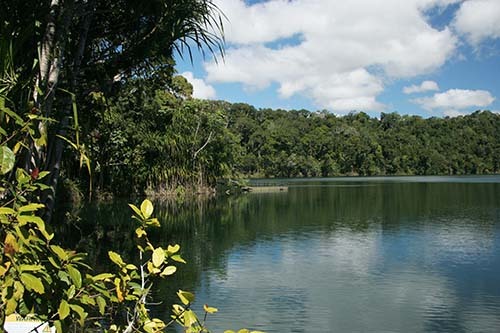 Yesterday we went to Lake Barrine and Lake Eacham, which are crater lakes, which we also visited in 1981, and they are still peaceful places. 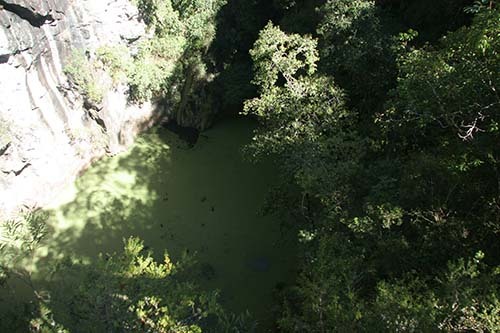 Super heated steam was created by a volcano and exploded, creating the craters, which later filled with water. At Lake Barrine we walked through the rainforest to see two giant Kauri trees. The largest was 6 metres around and 45 metres high. The trunk didn’t seem much smaller at the top of the tree, than at the bottom. 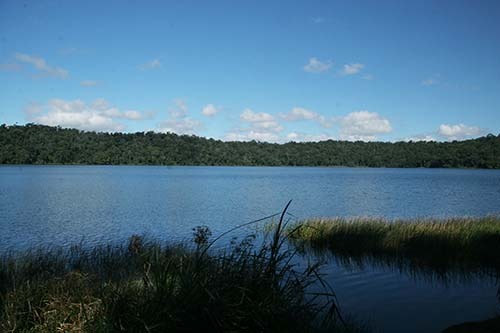 We then drove to Lake Eacham and had lunch, overlooking this lovely expanse of water, watching people swim, feed the turtles and wander around. 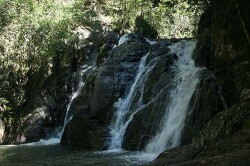 It was very relaxing and we spent a couple of hours there. 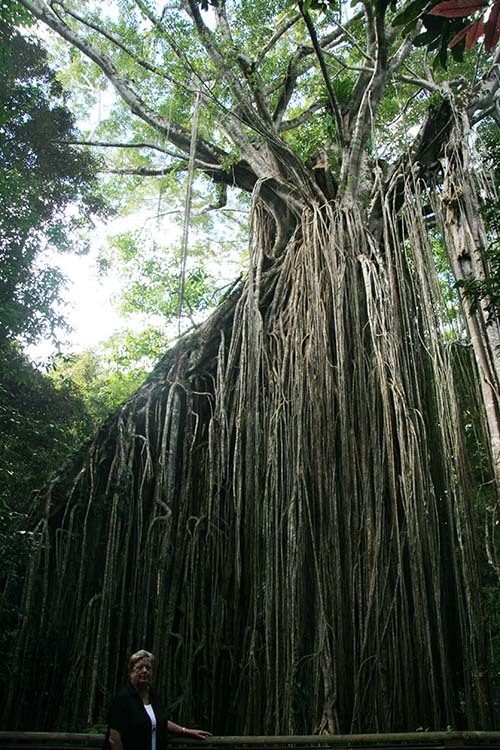 On our way home, we called in to see the Curtain Fig Tree, near Yungaburra. 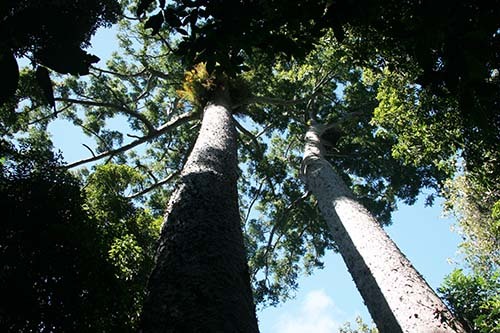 This amazing tree has taken over another tree, years ago, and has sent down aerial roots all the way around, causing a ‘curtain’ effect. The aerial roots drop down 15 metres. A walkway has been built around the entire tree. It was so large, Russ wasn’t able to get the whole tree in, but thispicture will hopefully give you some idea. All these places are not far away from the caravan park. There are loads of things to do here, so it looks like being a very interesting week.